This is a very unplanned post – when the idea popped into my head, I got quite excited as I’ve never done anything like this before. 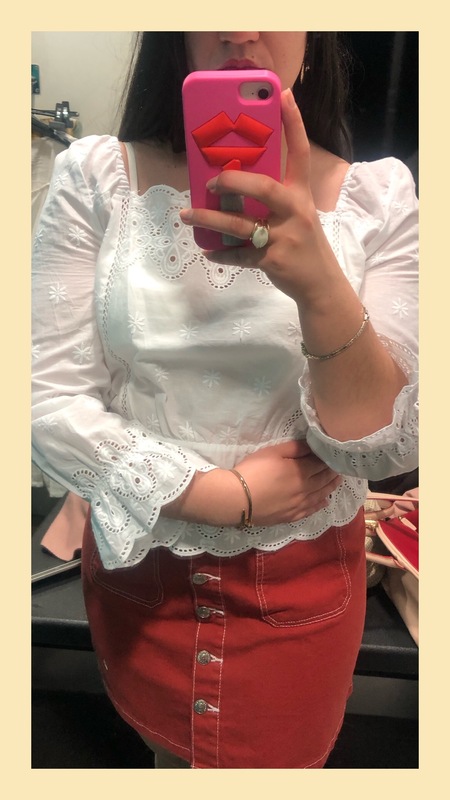 A few weeks ago I went into Primark for a little wander and very spontaneously decided to take pictures of myself in the fitting room. I NEVER do this, and don’t really know why I decided to do it on that day – I think at the time I was thinking about sharing some pics on my Instagram stories and doing a voting poll, and I might have also thought it would be a good second way to judge how stuff looks (apart from using my eyes). Primark dress and bag worn with Topshop cardigan (bought last year) and earrings (new), ASOS ring, and Miss Selfridge shoes (bought in 2017). Pictures taken in Swiss Cottage, north west London, on 29.03.2019. One could argue that from the back this skirt stuck out in a funny way, but overall I really, really loved how it looked. I’m trying to get into over-the-knee skirts again and this one made me feel pretty confident – not too short or fitted and effortlessly cool. But it did not come home with me. 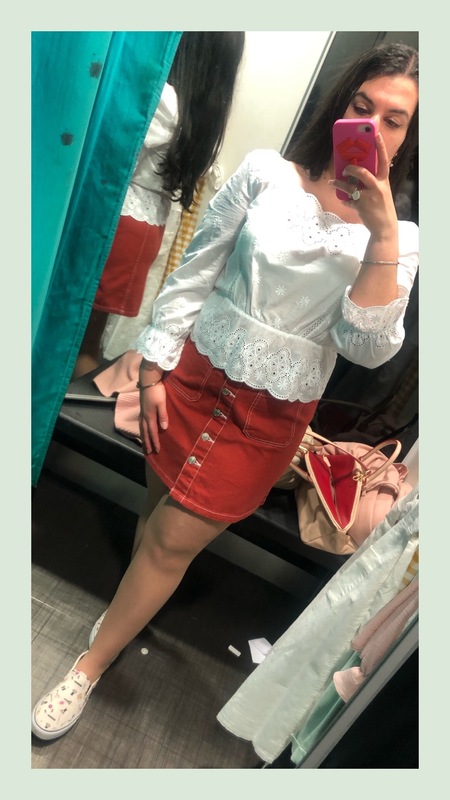 I partly regret not getting it as I found it to be such a good fit and super cute, but I just don’t think that burnt orange shade would work with a lot of my pieces (and it terms of style I wouldn’t team it with the blouse seen here, I just didn’t want to flash y’all). I literally had to stop and think about which tops and tees I had that could potentially work with it, and I could barely think of any as I have so many primary colours in my wardrobe. I really wouldn’t mind having more of this shade in my wardrobe because I do kind of love it, but on this occasion I don’t think it was meant to be. I hope Primark brings out this skirt in more colours! Again, broderie anglaise is another big trend for SS’19, and I’m here for it. And aw man, I am devastated about not getting this blouse. I tried it in a size 12, and I’m very in between a size 10 and 12 atm (size 11, boohoo). These pictures probably don’t pick up on it, but the fit of the size 12 wasn’t quite right. It was OK (not great) around the body, but it all felt a little too loose on my damn narrow shoulders and small cleavage. There was no size 10, so I had to leave empty handed. 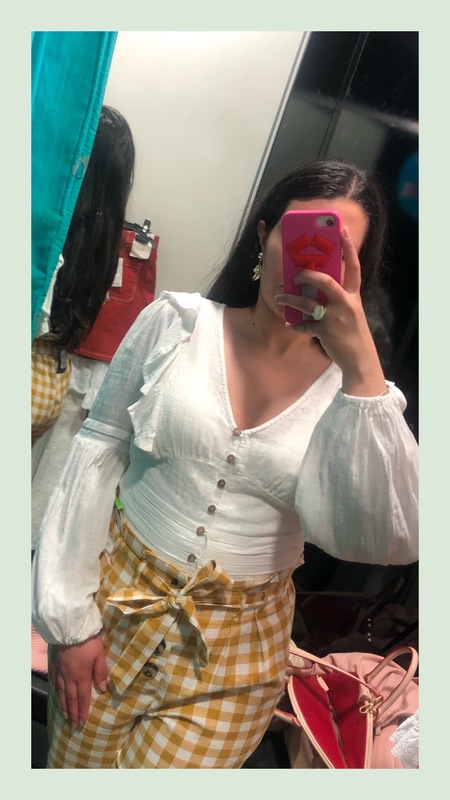 I’m not gonna lie, I’m genuinely upset I didn’t manage to find this top in a size 10 – I’ve been to different Primarks ever since to see if I could find it and have had no luck. I’m pretty torn about these trousers. I think they look really cool (I believe tapered trousers are what really suit me in the trousers department), but I was really unsure about the colour. 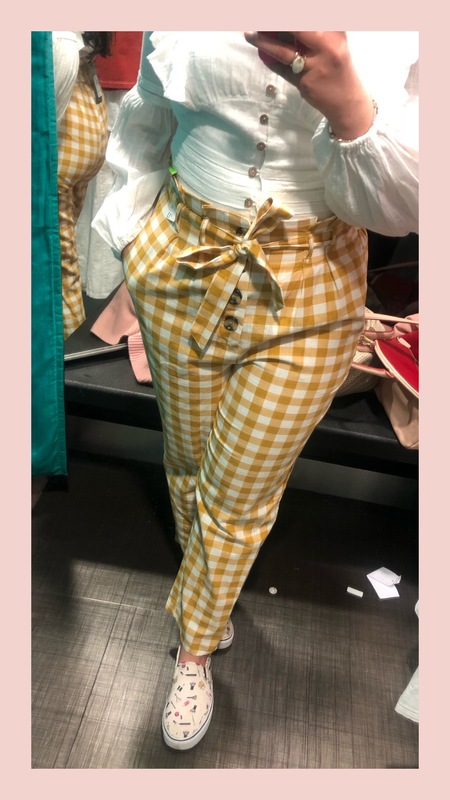 I’m still very unsure as to whether mustard actually suits me (although I think it would be fine to wear it not super close to my face), and I don’t know if there would be that many tops in my wardrobe that would really, really work with these trousers. Had they come in red, I would have been 100% all over that sh*t. But alas they didn’t, and so these did not come home with me. 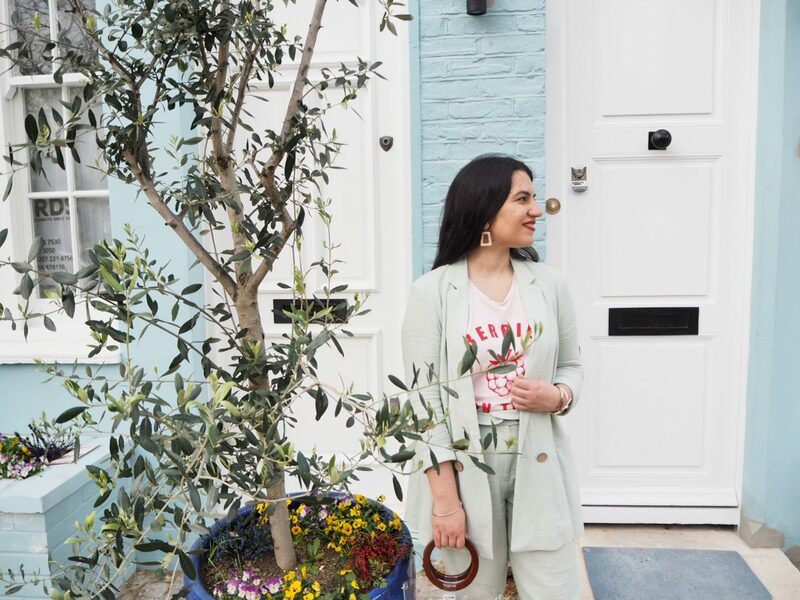 I tried it on in a size 10, and I wasn’t sure if it was one bit too tight – the main issue I’m facing if I go up to a size 12 is that there ends up being too much loose fabric around my chest and shoulders. I like white, but I think in the case of this top I would have preferred the pink version of it (and there was no size 10 in the pink version). I love V-necks but I actually found this top very low-cut – and even though I really don’t mind a good cleavage and have worn low-cut things before, I think this was 1 or 2 centimetres too low for me. I’m just not used to exposing that much of my chest and would potentially feel very self-conscious. Needless to say, this top did not come home with me. 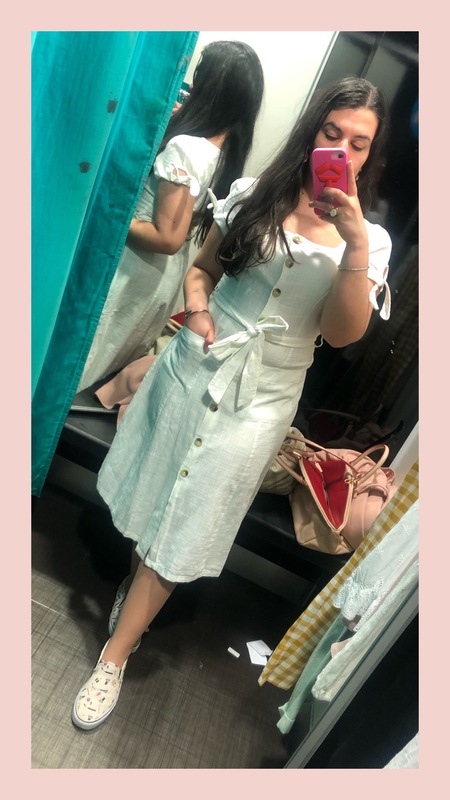 This was the piece that I was the most disappointed about, as it looked so nice on the hanger and I thought it would be such a good choice for work and/or slightly more formal occasions. But the minute I put it on I was like “Hell no” – it did me no favours! 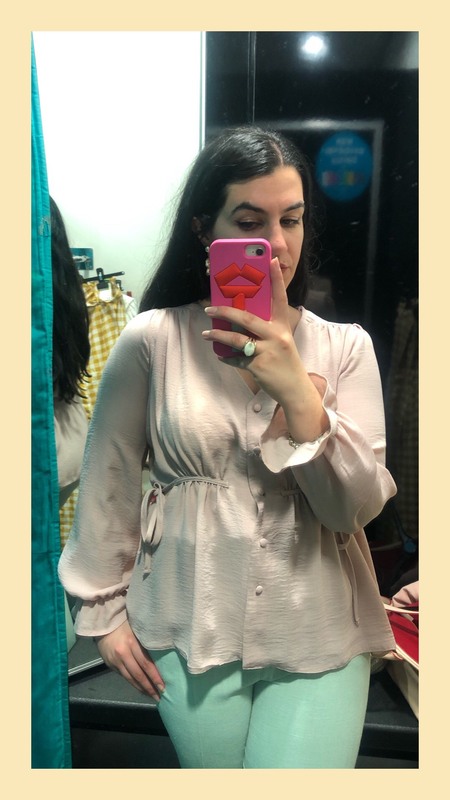 I feel like it made me look pregnant (and being pregnant is cool, but I don’t necessarily want to look it when I’m not) and I was really disappointed with the fit around the middle of the top – the third button just wasn’t sitting right. I loved the sleeves but the ties on the sides, which I thought would look really nice, did not help in any way. Such a shame, because I loved it when I laid eyes on it. This was the main reason I went to Primark. I’d seen this mint (or sage green? 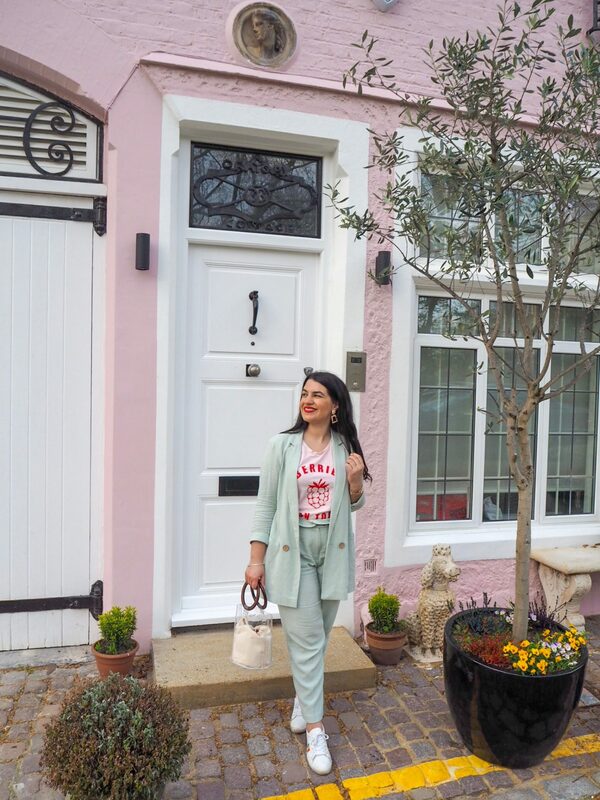 I like to think of it as mint) suit on a few bloggers and read Marie Claire’s article about it – consider me 100% influenced! I felt like incorporating another suit into my life and I couldn’t resist going for this one. Before this photo-taking shopping expedition, I’d been to Primark a few days before and bought myself the matching jacket and trousers. I’d bought the trousers in a size 12 because there was no size 10 – and even though they seemed to fit fine, I wanted to try the size 10’s just in case. 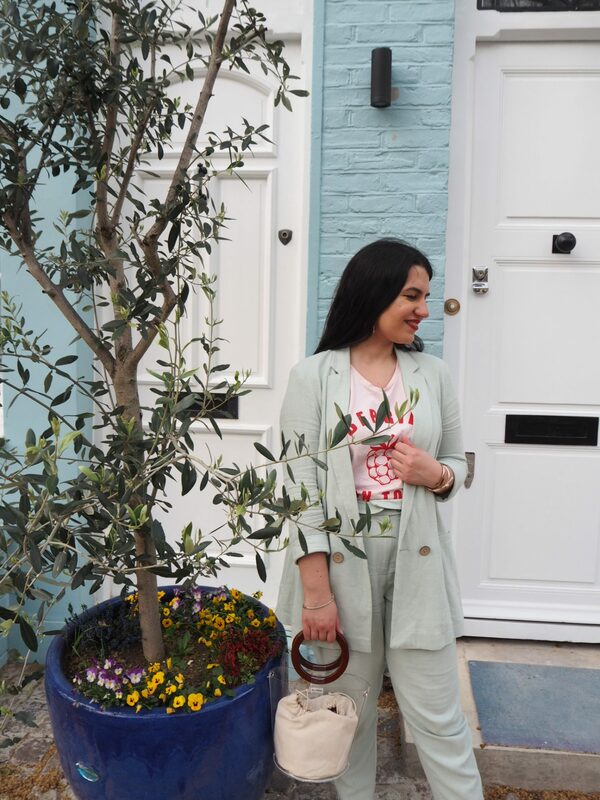 The ones pictured here are indeed a size 10, and I did prefer them – linen is such a creasy and stretchy fabric that sometimes it’s worth going down a size. As well as trying on the size 10 of the trousers, I thought I would try the size 12 of the blazer – I know, contradictory. 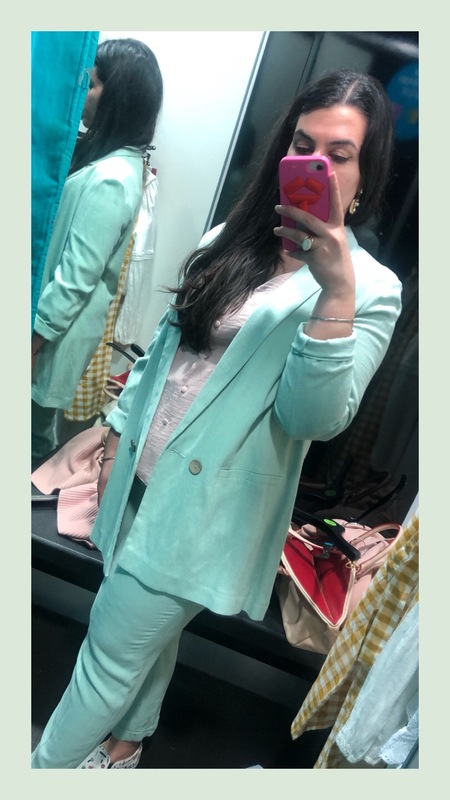 I’d bought it in a size 10 and as nowadays it’s very fashionable to go up a size in blazers to achieve that covetable boxy look, I didn’t like how the size 12 of the blazer looked on me and stuck to the size 10. I’m wearing the 12 in these pictures and even though the size 12 might not look that bad, I just felt like it really swamped my frame (damn those narrow shoulders). As shown in this post, I said yes to the suit – here are some more pictures of it (I like these pictures so it’s an excuse for me to show them). It’s strange how it looks super minty in Primark’s fitting rooms, whereas IRL it is quite a soft, toned-down shade. 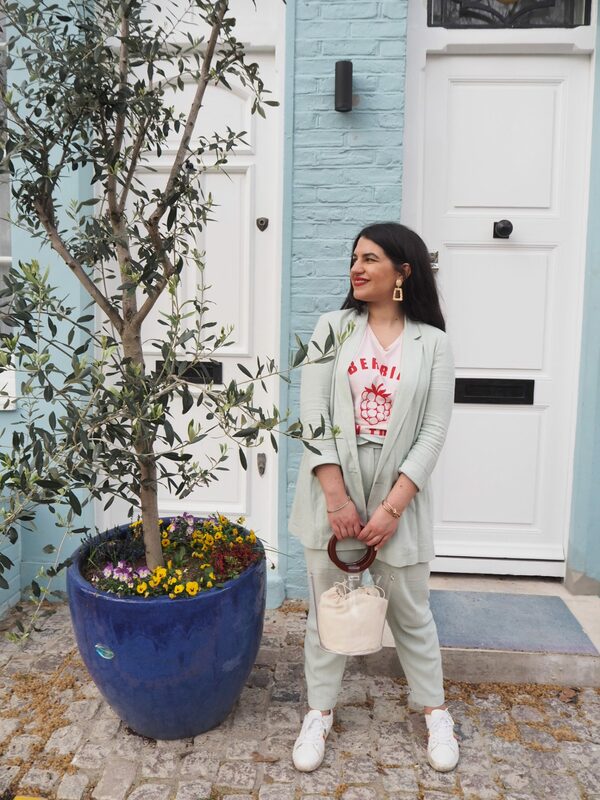 Primark blazer and trousers worn with Primark bag and earrings (new), Kaffe t-shirt (bought in 2017) and New Look trainers (seen here). Pictures taken on 30.03.2019 around Knightsbridge, London. So there you my have it, a little shop in Primark – I have said I don’t want to shop there as much as I have in the past but sometimes I can’t help having a look, it’s a guilty pleasure, so I’m glad I didn’t go too crazy! 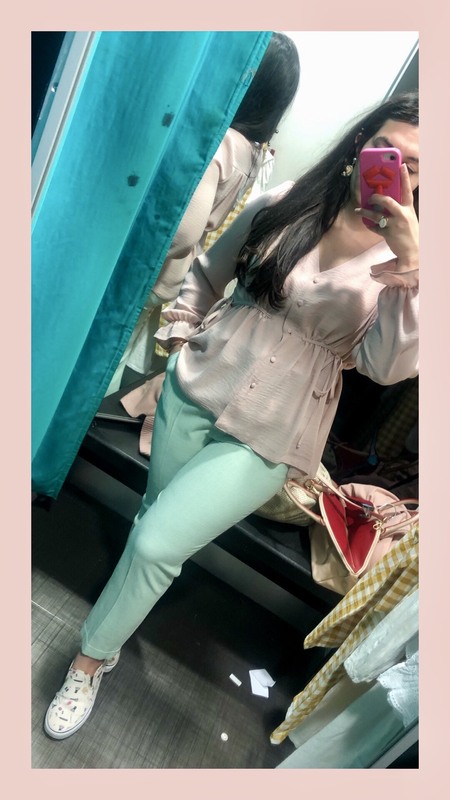 Apologies for the low quality of the fitting room pictures – since this post wasn’t planned I didn’t have my Olympus camera with me and the lighting in the fitting rooms was just bad. If I do make a series out of it (not making any promises here) I’ll definitely make more of an effort with my face and hair too! Any suggestions on which shops I can ‘do’ next? 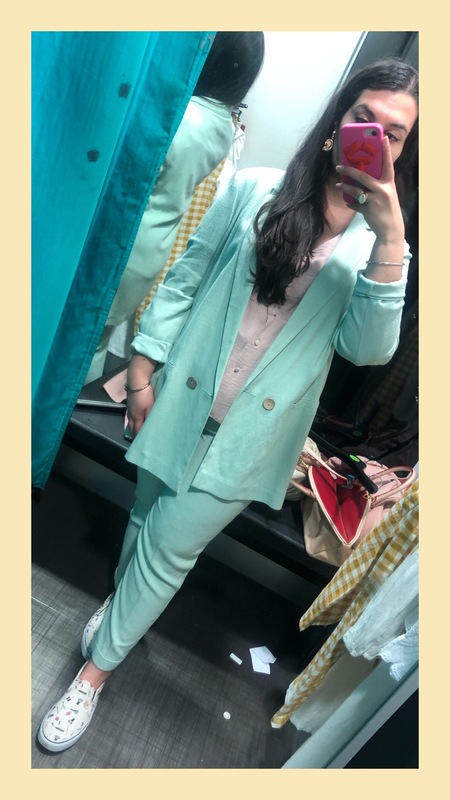 Fitting room pictures taken on 29.03.2019 in Primark Hammersmith – so most if not all of these pieces should still be available!